Foam roller exercises that target the iliotibial band and the tensor fasciae latae may increase your awareness of the body-mind connection so you can finally heal! Is this fibrous band the guardian of your emotions? I would encourage you to first read my article, Foam Rolling, for my views on the use of your mind-body connection when using your foam roller. Specific exercises on a foam roller use a simple technique called myofascial release. When we do the techniques ourselves, it is self-myofascial release. This is a great way to keep your muscles stress free, long, supple and free of congestion and knots. After reading this index article, you will better understand how this activity affect the well being, not only of your body, but your mind and soul as well! Foam roller exercises will treat your muscles in such a way, to stretch them, elongate them and roll out your stress areas. Athletes rely on the foam roller to roll out muscle knots, treat mild strains and get them back into the game. This self myofascial release technique helps you avoid more expensive treatments provided by therapists. You can now be your own therapist as you exercise with your foam roller in the comfort of your own home! As bodyworkers know, when you release muscular tension, often strong emotions are released as well. This can happen with foam rolling as you learn to focus on the areas that need your attention while you make practicing your foam roller exercises more reflective and meditative. Foam rolling helps you learn the process of "feeling it and healing it" as I am known to say. All body work modalities help you heal your body, mind and soul when you become more aware of how you specifically hold your tensions and how your emotions affect your body. If you need to purchase a foam roller to start your exercises, I highly recommend the premium, textured, EVA foam rollers. Often your local sporting goods stores will not carry these premium models. I have had a hard time finding a nice premium roller in the local sports stores. Even the discount stores now have the basic high-density models, but none of them have the cushioned ones. I especially prefer these models because they are textured, more comfortable and easier to use. The textured surface helps the roller stay put on your yoga mat better. The comfort of this premium roller is important if you are not used to foam rolling and you have a lot of sore muscles. If you look around online, you will find a full array of sizes and types to choose from. A 36 x 6 inch roller is the easiest to manage if you are just learning how to foam roll. The Iliotibial band is not a muscle but a fibrinous band. It runs along the outside of the thigh from the top of the iliac crest (hip bone), down the side of the thigh and attaches to the outside of the tibia (shin), just below the knee. The Iliotibial band’s function is to provide stability to the knee and to assist in flexion of the knee joint, as it assists the quadriceps muscles. The iliotibial band is often overused in runners, who develop iliotibial band syndrome when they quickly increase their mileage. When overused, the IT band becomes inflamed and causes pain, especially in the outside, lateral part of the knee and lower thigh. Tight gluteus muscles and quadriceps muscles can contribute to the Iliotibial band syndrome as well as running on uneven surfaces which causes a pelvic tilt. Pronation of the foot also contributes to the problem as well as bowed legs. Cyclist, hikers, walkers and cross-county and telemark skiers may get Iliotibial band syndrome as well if their activity is new or suddenly increased. I highly recommend you foam roll your ITB's if you are in this group. The Tenosr Fasciae Latae (TFL) muscle is also on the top of the outer thigh and the Iliotibial band attaches to it at the top of the hip bone, to form a continuous strip that runs along the side of the leg. The tensor fasciae latae is responsible to abduct the thigh or allow the thigh and leg to move in a lateral motion. If you stand with your feet together and lift your leg out to the side, this is the action of the TFL. The tensor fasciae latae also assists the hip flexors (iliopsoas) in flexing the hip or thigh. The body metaphor for the Iliotibial band is interesting. Since the hips hold in many deep emotions that have yet to be released (see Foam Rolling for the Iliopsoas and Piriformis), it has been suggested that the Iliotibial band, specifically is the ‘guardian’ of these held emotions. Especially if you are a woman, expect that when you do foam roller exercises of the hips, Iliotibial bands and tensor fasciae latae that you may experience great feelings that you did not know you had. If you are already a runner and/or have Iliotibial band syndrome, be especially aware. The tensor fasciae latae muscle, also on the upper, outer side of the hip and thigh is the muscle that abducts the leg, or spreads the legs and thighs. This is certainly a guarded movement for women, and may have significance for issues involving sexuality and abuse. Proceed slowly if you are doing the foam roller exercises for the Iliotibial band and tensor fasciae latae muscle for healing the body-mind-soul. If you have been sexually abused, you may wish to go to Beck Herdmann's website called Soul Expressions Abuse Recovery. She is also an R.N. like me, and her website contains wonderful information and more resources for your body-mind-soul healing. (See http://www.soul-expressions-abuse-recovery.com/index.html). Meditative exercises on any area surrounding and including the hip may bring forth unexpected emotions. When you roll your IT band and TFL, reflect on how this area may be speaking to you through your body window. Notice any emotions that arise when you practice your foam roller exercises. Breathe and release the soreness and release the emotions. Your guardians of your emotions may be tough to crack. As you roll, focus on which emotions you are guarding. Attempt to decipher your body's message to you. Create positive affirmations if you have problems with the iliotibial band and tensor fasciae latae. Say things like 'I am safe and surrounded with Love,' 'It is safe to be me, I accept all my feelings,' 'I release all that is within me and surround myself with Love,' 'My feelings are here to guide me, and tell me of my inner state and I accept them without judgement.' Open your heart to your own particular body-mind-soul issues, creating your own personal health affirmations that may fit your life better. You may want to start with foam rolling the Iliopsoas or Piriformis first. It is very therapeutic to write down your feelings in a journal after doing the exercises. Do no judge any of these feelings, just notice them and stay aware. This is developing intuition with your foam roller! Always use your own body's intuition as you move and vary the foam roller exercises in whatever way that serves your body best! Listen to your body and move to the area that needs attention. As you practice the foam roller exercises you will quickly discover where you hold your tension in your muscles. Vary your body position by shifting your body up or down, or from side to side. Vary the pressure by lifting more of your weight with your arms, or sinking deeper into the area. When you find a sore spot that needs releasing, hold the pressure there for as long as it takes for the muscle to release. Beware of your breath, always. Never hold your breath! This is your natural tendency, but it will just create more muscle tension. Like yoga, breathe into the stretch, breathe into the pressure. This triggers your relaxation response and will eventually allow the muscle to release! This is the key to effective foam rolling that heals the body-mind-soul! The more times you repeat these foam roller exercises, the easier it will become for you to breathe properly, relax and release your tense muscles! With the releasing of any muscle knot, you may also find that emotions come up and need to be released as well. Pay attention to your body sensations and to your feelings. Notice them and thank your body for its messages. Feel the release as you relax and let go!! Sit on the foam roller and roll to put your weight on your left upper leg, just below the hip. Stretch your left leg out straight, in line with your hip and knee. Push off with your right foot as you roll down your entire leg from the hip to the knee, keeping your arms straight and non-moving in front of you. Try to avoid rolling over the hip or knee joints. You can vary the pressure and the iliotibial band stretch, by how much you sink your weight into the foam roller. Shift your weight on the foam roller slightly, to the left or right to get the exact sore spot that needs your attention. It is beneficial to follow up with an iliotibial band stretch and a tensor fasciae latae stretch through yoga stretches like the Downward Dog and the Standing Forward Bend. You can increase the Iliotibial band stretch and the tensor fasciae latae stretch in both of these poses if you cross one leg over the other. Shift your weight to the back leg and you should feel a stronger pull in the side of the leg at the IT band and tensor fascia latae. Breathe into the stretch and hold as long as you are able to comfortably breath and for several minutes. Be sure to stretch on both sides using both legs as a crossover, to remain balanced. 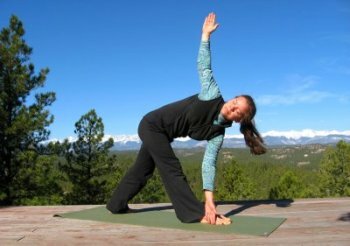 Also try the Triange Pose and the Revolved Triangle Pose for an even greater iliotibial band stretch and tensor fasciae latae stretch. If the standing poses feel too difficult, try the seated, supported poses like the Half Spinal Twist or the even easier Modified Half Spinal Twist where the outside leg is straight in front of you. Because all the muscles of the legs connect via tendons and joints, any yoga stretch that involves the legs, especially the standing poses will benefit the IT band and the TFL. 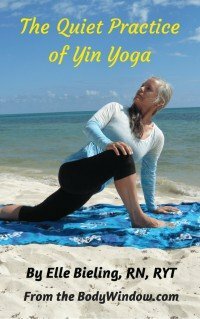 It is my wish that you develop your own intuition when you listen to your body and practice these roller exercises, iliotibial band stretches and tensor fasciae latae stretches. May your ongoing journey to heal your body-mind-soul with self myofascial release commence right now!